As judges we strive to improve ourselves and the way we operate tournaments in order to provide the best service possible to players, organizers and other judges. Sometimes the improvement needs to be personal (i.e. how to communicate a ruling or study of the documents); sometimes it may involve the program itself (i.e. new level definition or policy updates) or our procedures during the event. Let me present a new and more efficient way of performing Deck Checks in limited tournaments that has already been used at some GPs. I named it Australian DC technique because some Aussie judges taught me the technique in the Paris Magic Weekend 2011. The technique was tested at several GPs in order to verify we are not missing any of the usual checks and we are now ready to release it. The key point of the Australian DC is to save time by not changing the order of the cards in the decks: in this way, you’ll be faster in performing the deck check and players won’t need to shuffle the decks after the check. You may even be able to perform a full deck check and give only a +3 minutes time extension! The Australian DC is very useful for tournaments where the player to judge ratio is higher than usual because you’ll spend much less time performing deck checks and you’ll have more time for covering the floor. 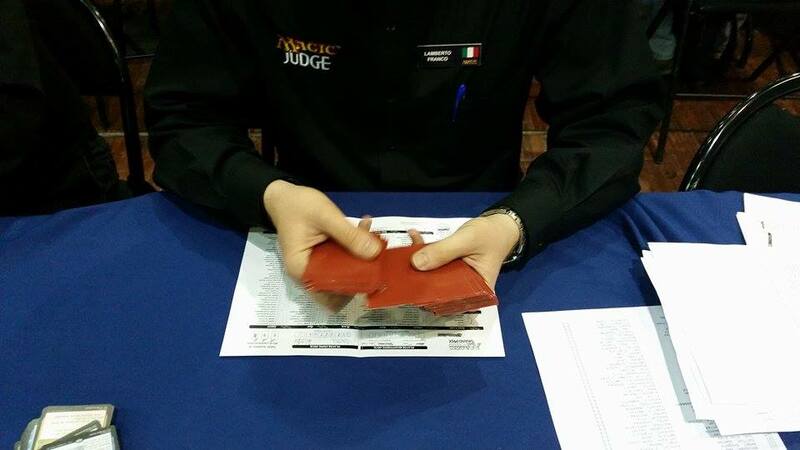 You may also use this technique when you are the only judge at the event, since you may check the two decks sequentially in 5 or 6 minutes total. In order to maximize the performance, you’ll need one judge to fetch the decklists (and count 40+ maindeck cards) while you are grabbing the decks, so that decklists may be available as soon as you arrive with the decks. You’ll need to tell the players that you’re using a new technique for the deck check and that you are returning the decks with cards in the same exact order, so that they won’t need to shuffle everything again and they may immediately start their game. You may perform additional checks on the sideboard in the usual way if needed. Usually you only need to check for cards already sleeved or cards in the top part of the sideboard, since they are the ones that the player may conceivably side in. If you find any problem with the deck that requires you to alter the order of the cards (i.e. possible patterns in the sleeves or your dexterity errors while sweeping the deck), please give to players the traditional 3 extra minutes of time extension for properly shuffling. Since you are not spreading the cards around, you don’t need a big space to perform the deck check: you may eventually select some space closer to the players like an empty table. 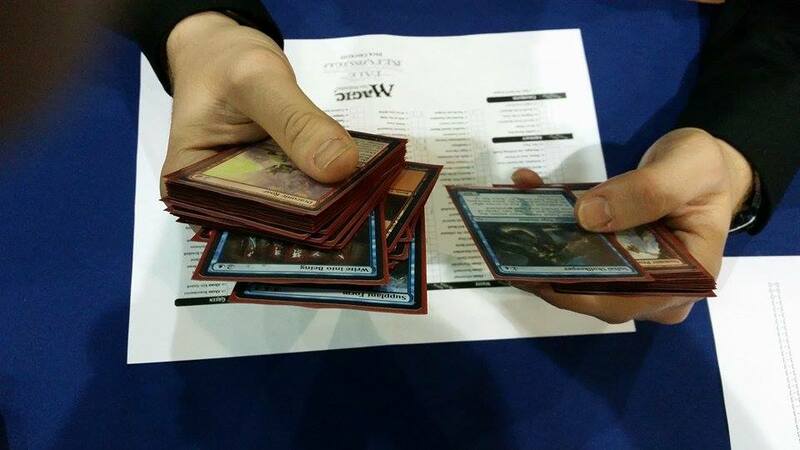 If you have clipboards available, your deck check partner may place the decklists on the clipboards and you may perform the deck check on the clipboard standing a few meters away from the players. Think how much extra time you may save this way! You may use the Australian DC in Limited events only, since it’s much more efficient the fewer copies of a single spell you have. The technique performs the best for single-set Limited, so that you don’t have to turn the decklist back and forth for cards of different sets, but may be applied to multi-set Limited by repeating step 3 once per set and it will still be faster than a traditional check. You may achieve the highest speed during midround deck checks because you don’t need to follow step 2 (players may change any number of basic lands) and in step 3 you need to check only against the total column (no need to check for the played column). All you’ll have to do is to review the deck once face down (step 1) and once face up (step 3) (Midround video: https://www.youtube.com/watch?v=nIRLYTkVhjQ). I’ve witnessed a judge performing this deck check in an astonishing 48 seconds! The Australian DC is a much more efficient way of performing limited deck checks, because you don’t waste time dividing cards in piles and you don’t have to give players 3 minutes of extra time for shuffling. Judges will be able to perform multiple midround deck checks and players will have to wait only for about 3 minutes to start their game without the hassle of extra shuffling. The downside is that players are not used to receiving the deck back from a check and not shuffling it. Tell them clearly that there is no such need because you did not change the order of the cards and invite them to resume play by shuffling their opponent’s deck. I want to thank James MacKay , Nathan Brewer , and Fabian Peck for the willingness to experiment and teach new techniques and Lamberto Franco for providing pictures and video for this article. If you have an article you'd like published, please Email judgearticles!